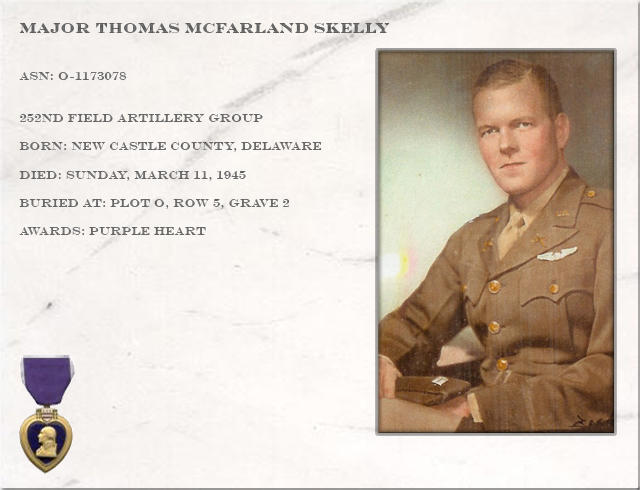 Major Thomas Skelly MacFarland enlisted in the Army in February 1941. 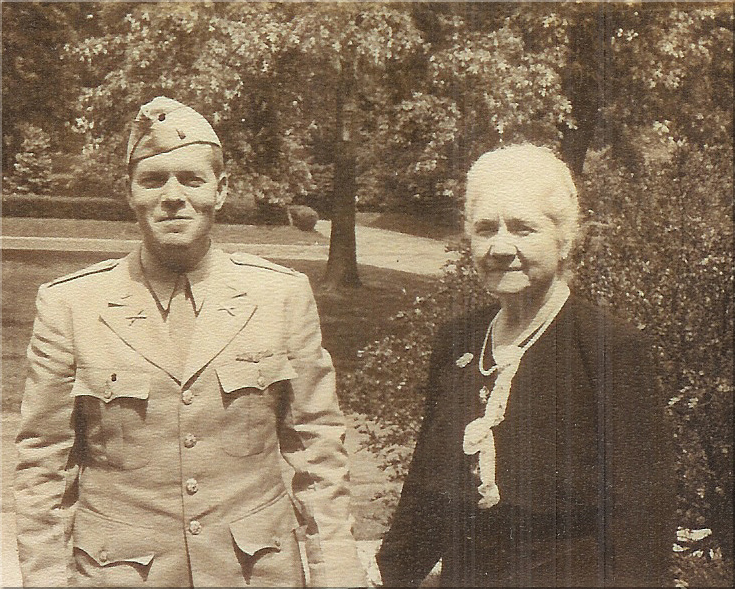 In November 1942 he was commisioned to the 252nd Field Artillery Group as an air observer for the HQ of the 252nd. During a routine observer flight with a Piper Cup L.4 which started at 1500 h, Thomas and his pilot Lt. Frank Hutlin were attacked by a couple of German ME 109's. Lt. Hutlin tried to evade the German fighters, but one of the Messerschmidts managed to hit the small observer plane, rendering the aircraft without control. Both men tried to land the plane under very difficult conditions. The small plane's right wing touched the ground first, causing it to spin around the wing across a field before coming to a halt. This happened near the German village of Suchteln close to the town of Rheinberg. Lt. Frank Hutlin was shot in the right leg and had several wounds in his back and face. Furthermore he had a fractured left arm. Thomas was fully conscious but beside several other wounds his left leg was fractured. Both of them were transported to a field hospital by some infantry troops. 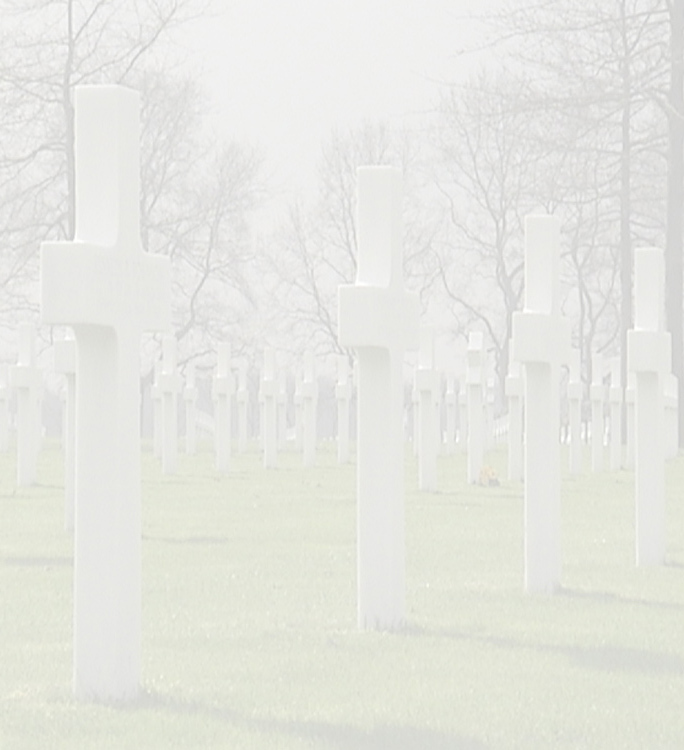 During the transport Thomas made clear that he wanted his pilot to receive special care, because in his view the Lieutenant's wounds were worse than his own and he requested to stay close to his pilot. 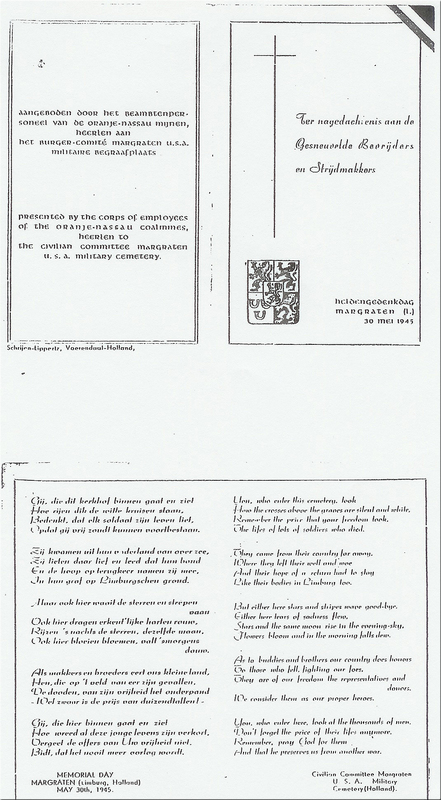 At the hospital both men received a bloodtransfusion and shocktreatment. At the fieldhospital there were no means to take X-rays, so after some additional treatment they were transported to a better equipped hospital. Once taken, the X-ray pictures showed Thomas had a frontal fracture of the skull which was so serious that any further surgery was considered useless. 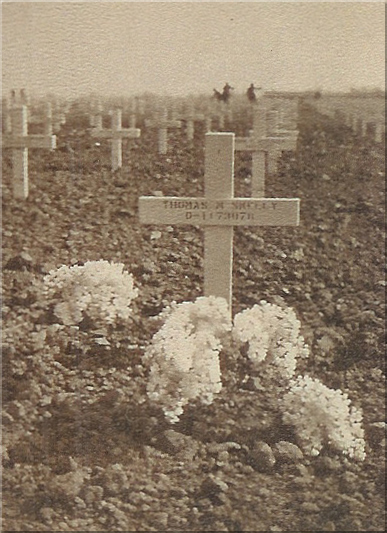 On Sunday, 11 March 1945, around 22:30 Thomas fell into unconsciousness and half an hour later he passed away. Chaplain Captain John J. McCallen fortified Thomas with the rights of the Holy Church when it became clear that Thomas'situation deteriorated. Later Chaplain McCallen served a requiem mass with two officers of Major Skelly's air section attending. 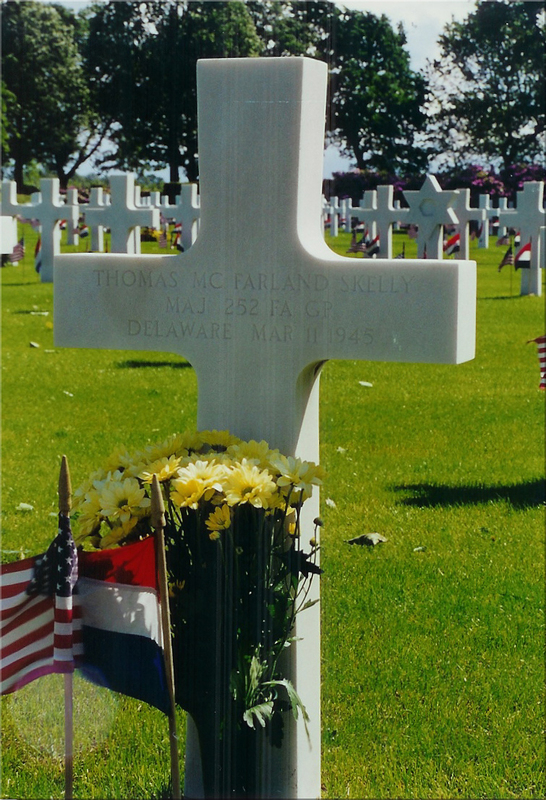 Thomas McFarland Skelly was laid to rest at 09:00 h, 14 March 1945, at the U.S. (Ninth Army) Military Cemetery Margraten, at Plot V, Row 5, Grave 114, marked with a wooden cross. 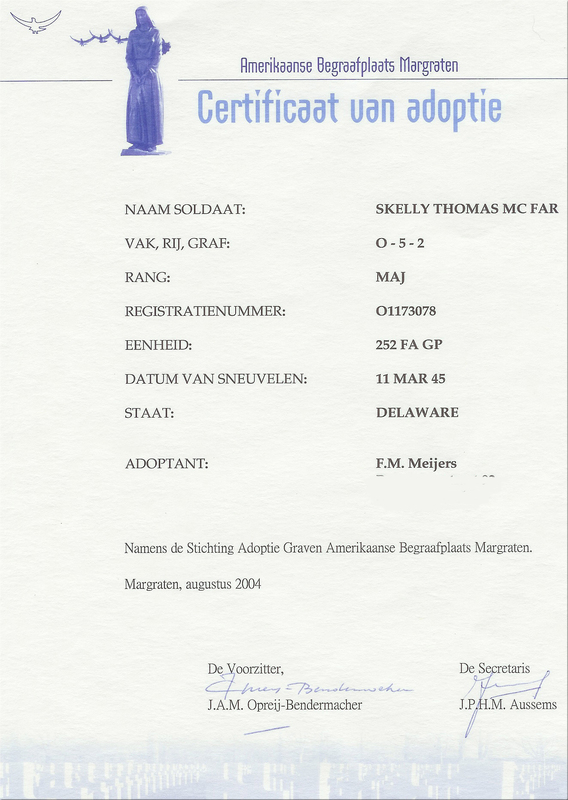 After te next of kin had decided the Magraten Cemetery was to be Major Thomas McFarland Skelly's final resting place, he was reburied in 1949 at Plot O, Row 5, Grave 2.